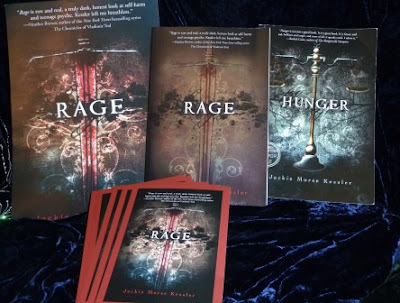 Today I am participating on a blog tour for Jackie Morse Kessler's latest book, Rage, the second book in her Horsemen of the Apocalypse series. The books are part of a series but need not be read in order. My review contains no spoilers for Hunger or Rage. Melissa “Missy” Miller feels like her life is spinning completely out of control as her boyfriend dumps her, then humiliates her in front of their entire class by showing the world her scars. To deal with the pain, she cuts more and more, until she cuts too deep and is offered an ultimatum by the Pale Rider, Death: die forever, or accept her new role as the new War, the Red Rider of the Apocalypse. Missy’s new “job” puts her in contact with not only external battles but internal ones as well. For War is very persuasive and is always trying to convince Missy to let go and unleash her fury on all those who have hurt her and deserve to be hurt in return. To tame War and herself, Missy must come to terms with what is out of her control…and what is. I was really impressed with Hunger, the first book in this new series that combines mythological influences with serious modern issues. However, I have to be honest and say that the second book, RAGE, didn’t work for me quite as much. I cannot say anything bad about this series’ intentions. These issues—anorexia and self-injury, body image and bullying—should be taken with the utmost seriousness, and yet Kessler uses such a wonderfully unique way to talk about these issues, which might have been beaten to death in more academic or psychological fields. The idea of these new Riders having to overcome their own issue in order to fully embrace their role and help out others is wonderful. Throw in some persnickety steeds and a wry-voiced Death, and you’ve got an utterly cool blend of the magical and the all-too-real. RAGE didn’t quite fulfill its mission for me, though. For some reason, I found it really hard to connect with Missy. Not that her situation does not provoke sympathy, for it does, oh it does. But she was so defined by her pain, by her humiliation, that she felt less like a real person and more like a literal “poster girl” one holds up to a crowd of bored “at risk” high school students and says regarding her, “YOU SEE WHAT CAN HAPPEN? YOU DON’T WANT THINGS TO TURN OUT LIKE THIS.” Not a very effective teaching strategy by any means. RAGE felt, to me, like it was concentrating much more on the message it was trying to send and less on developing unique characters or a compelling plot. Supporting characters were flat and not very convincing: for example, I knew I was supposed to feel angry at Missy’s bullying classmates’ words and actions, but at the same time I felt it was more for show—kind of a “this is what bullies are supposed to do and sound like” act. The message got in the way of the story, I guess. If you read and enjoyed Hunger, I encourage you to give RAGE a try. Perhaps it’s been a while since I’ve read Hunger; perhaps you will find less issue with RAGE than I did. Sent for review by Blue Slip Media. Stories can be powerful. And at their best, stories can help change the world. If there's a unifying theme in the Riders of the Apocalypse books, it's how we choose to destroy ourselves -- and how we choose to save ourselves as well. That's where charities come in. Then I started working on RAGE, which looks at self-injury. This was a completely new topic for me; while I've experienced emotional overload, I haven't self-injured (well, other than the bulimia, but that was about food and control, whereas self-injury is more about emotional control). After doing a lot of research, I started writing the book -- and I thought about donating some of the proceeds to a different charity. The problem was, I had no idea which charity to consider. And then, serendipity: my critique partner mentioned the organization To Write Love On Her Arms. So I checked out the website and I was amazed by what I saw. TWLOHA helps provide support for people who are wrestling with self-injury, addiction, depression, and suicidal thoughts. And that's when I decided that part of RAGE proceeds would go to TWLOHA. If you've bought HUNGER or RAGE, thank you so much for helping to make a difference. Because it's not just stories that can help change the world; actions do too. Thank you for the guest post, Jackie! TWLOHA is an organization that has personal meaning for me and some of my friends. If you haven't heard of them and what they do, I encourage you to check them out. It might bring tears to your eyes. Riders of the Apocalypse giveaway! Jackie's next stop is Mundie Moms at http://mundiemoms.blogspot.com/. I've read both of the books out from this series and find it such an interesting way to tell stories about difficult topics. Neither are preachy and both will likely provide guidance and insight to teens who may be struggling or attempting to find more information on anorexia or self mutilation.